President Muhammadu Buhari promises to prosecute looters, declared that only God would punish the Peoples Democratic Party (PDP) for looting Nigeria dry during its 16 years in power. Report has it that Buhari said this at a meeting with local and international support groups at the Presidential Villa, Abuja. He said ill-gotten properties of the guilty would be confiscated and sold and the money realised would be put into the treasury for public use. Buhari said that upon his assumption of office, he approached the Governor of the Central Bank of Nigeria (CBN) who told him there was no money in the federal treasury. He noted that there was no infrastructure or any developmental achievements to justify the draining of the substantial earnings from crude oil. He said: “I have said this for the umpteenth time and I have challenged them to prove me wrong. In those 16 years of the PDP rule, Nigeria was getting 2.1 million times 100 (2.1 million barrels by $100 per barrel) every day, every week, but when we came on board, the price fell to between $37 and $38 and hung around $40-$50. The last time road rehabilitation took place, he said, was under General Sani Abacha, when he served as the Chairman of the Petroleum Trust Fund, stressing that the roads were rehabilitated up to the east. Speaking on his integrity, Buhari said: “If I didn’t stick to my principle of accountability, I would have been in trouble by now and I have no regrets. The leader of the delegation, Dr. Mahmud Mohammed, said the groups supported him because of his integrity and commitment. He said for the first time in the history of campaigns, they were campaigning with meagre funds generated from well-wishers because the president specifically directed that no money from the public funds should be spent on his campaign. He said: “From tomorrow, we will not sleep. We still start house to house, shop to shop and market to market campaign to ensure your victory”. 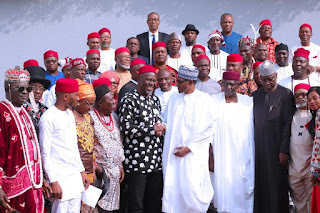 President Buhari also received leaders of Igbo World Union and faction of Ohaneze Ndigbo at the Villa on Friday. He said his administration has successfully created a level playing field for all Nigerians and will continue to ensure equitable provision of developmental projects across the country. He explained that his administration has been executing critical infrastructural projects across the country such as the Second Niger Bridge and social investment programmes to support the less-privileged in the society. “As you all know, the key issues that affect our country today are insecurity, corruption and an economy that solely relies on a single revenue source. “These issues impact all Nigerians regardless of tribe or religion. The perpetrators and victims of corruption and terrorism are from all tribes and religions. Poverty and unemployment also cuts across all tribes and religions. “We also did not discriminate in our response. We restored security in most of the conflict impacted areas. “Please, be rest assured that my commitment to creating a peaceful, inclusive and corruption-free Nigeria for all Nigerians remains as strong as ever,’’ he added. Earlier in his remarks, the Secretary General of the Ohaneze Ndigbo, Uche Okuku had apologised to President Buhari for the purported endorsement of the Peoples Democratic Party (PDP) Presidential candidate, Atiku Abubakar, for the 2019 elections by the socio-cultural group. The President General of Ohaneze, Chief John Nwodo, whose tenure was believed to have expired, had last week joined three other socio-cultural groups to announce Atiku’s endorsement at a news conference in Abuja. However, Okuku, while apologising to the President, said that Nwodo only expressed his personal views and not that of Ohaneze Ndigbo, saying that nine-man panel had been instituted to investigate the issue. 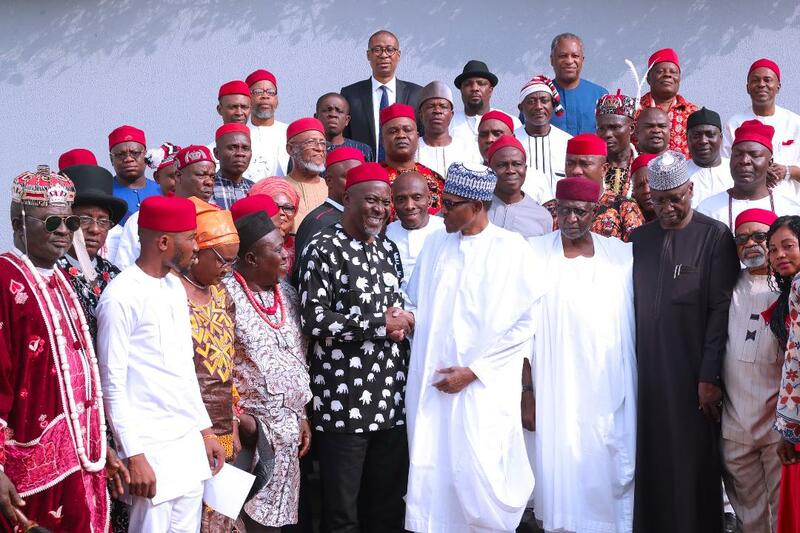 The News Agency of Nigeria (NAN) reports that other groups that expressed support for the President during the visit include World Igbo Congress, World Igbo Union and Ndigbo Delegate covering the 19 Northern States.